I looked around for info on replacing this piece of glass. 3 out of 4 places I called said they replaced the entire assm. I was able to source the glass locally for $177. Ebay has them cheaper. My part did not have the lower channel, this made it easier come to find out. Prep: remove rear seat, mega cabs: unbolt seat, fold, and slide forward, in order to remove c pillars to remove rear rear cab panel. This is needed to get enough room to unbolt lower seat belt bolt in C pillar. 1. Slide the upper run channel (1) out of the window frame (2). 2. Slide the vent glass (3) upward to remove from the lower window frame (2). 3. Lower the glass (3) out of the upper window frame (2) and remove. searching around google i didn't find much info about installing the glass. This info pictured was about the best i found. I wanted to elaborate a little on the steps and put others at ease on how easy it really was to replace. 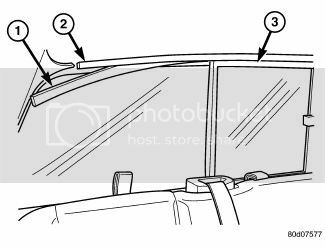 step one: while cussing the person or yourself for the broken window in the first place, use a shop vac and small pick/screw driver. Remove all broken glass from upper and lower window tracks. the lower track has the cables on each side. Make sure all glass is removed! step three: take new glass and place top side into the top of the window frame. this will give you plenty of room to get bottom of the glass into position. push glass into the lower window channel. Glass will fit snug. Hold glass on the sides and wiggle it home. step four: place upper window channel into upper window frame sliding towards Dr side. Make sure when window channel gets to the edge of the new glass it goes into the center of the window channel. keep pushing towards the Dr side until you can push the pass side back channel into the top window frame where it sits flush. yes the pic is non power slider. If you are mechanically inclined, after glass clean up, it should take all of 36.2378 seconds to install. 05 qcsb, 4x4, G56 trans, home made straight pipe, GDP 2 mic secondary fuel filter, manual fast idle enabled, drop n lock turn over ball in the box, gauges boost, pyro, LP, and rail. The TRUCK is RED but the TRACTOR is GREEN!